- Am I being crazy giving up work, with the high cashflow it gives me? "Biting the hand that feeds you" comes to mind. - ‎The ego mind has come up with some creative reasons why I should Definitely Not Leave! I'll be bored! We'll run out of money! etc. - Reading https://livingafi.com/2015/10/09/that-guy/ helped me realise that I'm already able to live a 75% "that guy" life - I work-from-home, I can take an hour or two off work whenever I want and do what I want/need to. - ‎A month more at work would be the equivalent to a year of part-time minimum wage. Should I stay for "another" month? - ‎I don't really use the excess cashflow today, only to increase investment capital. - ‎There might be a better/less permanent exit strategy (see below). - My wife and I discussed children. We've discussed it over the years, and both agreed that we want 1 or 2, but now we're serious. I've estimated an extra £400pm per child, which will push back ER to November 2020 as it stands. OTOH, £400 is one day of IT contracting work, so I will look to pursue contracting/consultancy further. Naturally, I've been reading about Shared Parental Leave. It may very well be useful for me to stay at work a little while longer, take the maximum parental leave of 48 weeks in two parts, coming back to work for 1-2 months in the middle. From the financial side, this provides a good testbed, with a temporary reprieve in the middle, and effectively zero risk. (There are also non-financial benefits like being around while children are growing up, instilling our own values instead of a nursery's values). So, as the months go by and we get closer to the FIRE target date in August, it's looking much less likely that this will happen. We'll see how this pans out in the coming months I guess. - We have also toyed with the idea of buying a farm. Madness? Maybe, as it would be an extra £1,400 mortgage required per month. The logic is that it gives many options for business ideas that we have, potential for a more self-sufficient life etc. The frugal and growth parts of me are now at war. An observation: I am naturally low on openness, and guarded with information - Its a form of control. However, I've realised that it's counterproductive, in that there are many people out there like me, I can help them, they can help me etc. In the last few months, I've made a conscious effort to be more open, and it's proving to be a positive experience. Last edited by fingeek on Sun Mar 04, 2018 6:20 pm, edited 1 time in total. Hey fingeek. I have just discoverd your latest journal post and I am very surprised by your SR! Wow, quite high! Your other financial numbers (networth, years of saving to 4%) are also quite good. As you also asked me about my expenses, I am also interested now With such a high SR, it is always very interesting how that expenses from a few percenteges, 9% in your case, are structured, ... Again, I am impressed. How is that possible? If I calculated correctly you spend around £1,800 (based on fixed and optional expenses). So your income must quite high. If you can lower your expenses by using ERE principles, I think you can even shorten your years of saving to 4%. Hi wolf. The way I calculate my SR might be a bit off, but it helps me keep the goal in sight. I calculate my SR against my "normal" job, and don't include other investment/property income. So I calculate my SR as savings / job income = £3,845 / £4,200 = 91%. But that second number itself isn't all that meaningful to me. The idea is, once my SR >= 100%, then I'm no longer dependent on my job income. 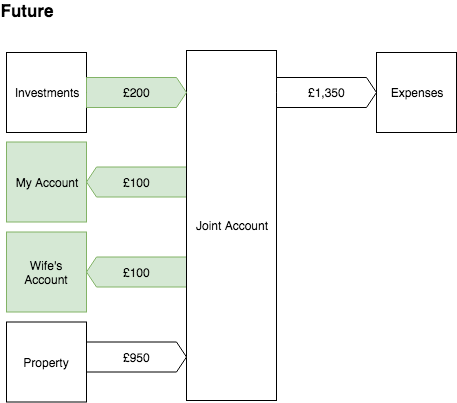 I have structured things so that almost all of our fixed/core costs come out of a joint bank account. The idea was to start decoupling that direct link from job income from expenses, and to prepare for the eventual loss of job. You may recognise this from the Rich Dad, Poor Dad book . Here's an attempt at showing current and future states (I learnt a new thing today: http://draw.io is awesome!). If you can lower your expenses by using ERE principles, I think you can even shorten your years of saving to 4%. I think the assumption you made was that we're not living a really frugal life at this moment - And you are absolutely right! This is something I think we will look at more closely this year, to see if there are other things we are willing to give up. - We are not willing to downsize our home. - I've started looking at whether or not to sell my car - That would be the next most significant cost, at £995pa / £83pm, so this would bring us much closer to FIRE. As I'm looking at these figures today, it's tempting me more and more to just sell up. Thanks . - Next significant cost would be to reduce food expenses. We spend £190pm / £45pw which I don't think is too bad, and I'm not sure we would be willing to drive that down lower. - In the last few years, I've subscribed to the outsourcing philosophy in a number of areas. Looking back, I've lost a few skills/motivation, and it will be important to regain the ERE philosophy in this regard. The nice thing about looking at some of these, however, is that it's starting to build "padding" - So that when we eventually hit FIRE, some of that padding will still be there and will hopefully mean we can move between "lean FIRE" and "normal FIRE" depending on the economic climate. Thanks for giving me some things to think about! Would love to hear your thoughts about other ERE principles. Another steady month without surprises. The great thing about tracking month-by-month is that it builds confidence in the average expenses level. I came across http://liberate.life/index.php/2016/09/ ... tank-taps/ which is a nice way of approaching the logistics of FIRE. I planned to have a bulk of money to live off, while income drops/drips into the pot to keep it full. I like the high/low watermark approach of this blog post, and will adopt that - It should reduce any money micromanagement need by having an effective schmitt trigger to debounce any monthly actions. I've started reading the book "Your Money Or Your Life". Some of it has made me angry, and introspecting on that anger shows the classic INTJ safety mechanism "you're wrong and stupid, I'm right, I'm therefore angry that you even suggest such things". I've also been reading a lot of stoicism which has had a major positive impact on my life and thinking. In this particular case, I asked myself "what if the book is right? ", and that lead me to some truths I've been hiding from myself - I'm not really all that frugal in the grand scheme of things (thanks wolf! ), and fear has run my life on a more subliminal level than I've ever realised before. These are all positive observations! Last edited by fingeek on Mon Apr 02, 2018 7:56 am, edited 1 time in total. 1. Fix/simplify asset allocation, and reduce costs. DONE 100%. Decided to go for the VG world, after reading https://theescapeartist.me/2015/07/28/t ... portfolio/, https://www.youtube.com/playlist?list=P ... spiwlxfiQk, and some other reading. ETF because of ISA size. Currently in the Vanguard LS100 fund, but will move into the world ETF in April new tax year while filling the ISAs again, so to only incur one transaction fee. 2. Review the current investment platforms, to ensure I'm optimising for fees. DONE 100%. Staying with HL. By moving to ETFs, platform fee is only £45pa. With an eventual ~4x quarterly withdrawals at £13 each that's an overall £97pa fixed fee. Regular savings into an ETF are £1.50 a month, which isn't too bad either. INPROGRESS 50%. Pub conversion property purchase should complete next week. Keeping eye out for 2nd. INPROGRESS 70%. Lendy all withdrawn, aside from defaults. CollateralUK went into administration, so my funds there are locked up, but eventually will hopefully come back to me. MT and ablrate are being drawn down. Will be finished with this by end of Q2. INPROGRESS 10%. Wife started looking at en suite replacement. No progress on the house repair bits. I'm ashamed to say we are considering getting a handy man in to get this all done. ‎NOTSTARTED 0%. However, the shared parental may come into play if I quit later than schedule. INPROGRESS 20%. Still aiming for this as planned, but looks less and less likely as it closes in. Fear and OMY syndrome are kicking in at this point. I have started to assess my options. It's becoming more clear that freelance would best fit my time flexibility requirements. Second to that, staying in my current job is probably the next best option. I can't see me doing literally nothing because (1) I'll get bored quickly and (2) I'll likely want to do a bit of work to find us that ~£200pm in small luxuries (the odd meal out, socialising etc). Thank you for this update. This year sounds promising. You are on your last 10% on your way towards FI. Congratulations. Now you have the challange to manage the transition time. I wish you best luck. Please keep us update, because it is always a great way to share experiences and wisdom. Good to see how you assess those options, regarding time- and money freedom. Take care! Heavy hit to savings rate due to taking a loan out for property investment. This has no hit on net worth, and should realise a fairly large net worth and cashflow uplift once the property refurb is complete in ~6-9 months. I've become aware that I'm over-obsessing about money. I need to find more hobbies so I can start to figure out my post-RE life. I'm waiting to get to the goal before thinking "that's it, ive done it, I'm enjoying life now" - But the big trick is that I've been like this ever since university - Always chasing that next good thing thinking it will be the thing that makes me happy for good. But that's not how it works. I need to focus on enjoying every day for how it is, and let the rest come naturally. So I've started to force myself to care a bit less about those small money items. It might not be the right philosophy for the long-term, but it will loosen my short-term mental unhealthy grip on frugality, and help reduce stress levels. I've decided I will just work another month or two if that's what it takes to rid myself from the obsession. I don't yet have the mental energy to think about hobbies, health and things outside of work, but I know that I need to start building my life outside of money - I will add a yearly goal to help formulate this. I've finished reading YMOYL, and it's confirmed some of my thoughts, and given me other things to think about. I fully buy in on "financial interdependence", and I'm realising the power of networking and opportunities that will come out of it post-FIRE. Thanks for the vote of confidence! . I will say that up until now things have been "easy" - Build a plan, follow the plan. The hardest part for me is now - And I realise this is what my prior depression/lostness was indicating to me. What does one do when he/she doesn't have to get paid? My historical thoughts were "oh, well I'll deal with that after FIRE". Again, I realise I've missed the point - Time to start figuring that out! It's always time to start figuring that out. Regarding "financial interdependence", do you have some ideas on your mind? Or can you share some examples? I heard about interdependence initially in the book from Stephen Covey "The Seven Habits of Highly Effective People". He wrote that in the start it is dependence, then follows independence and after that (the highest stage) interdependence. At that stage you cooperate with other people in order to build something, that you would not have achieved alone. Is it the same with "financial interdependence". Last edited by wolf on Wed May 30, 2018 1:23 pm, edited 1 time in total. It's said that what you think, your mind will create. Since last month I realised I need to start building my post-"main-work" life. Already this month, I've noticed a change in mindset. 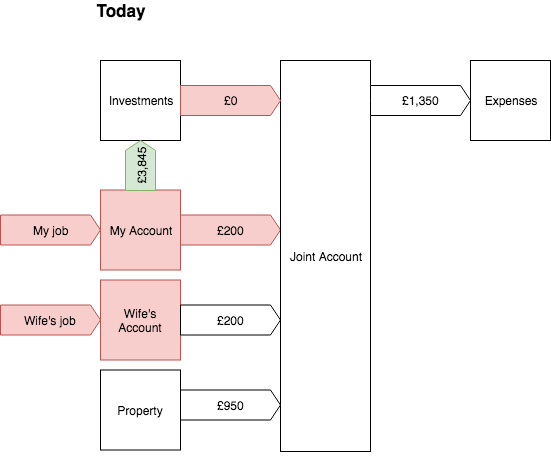 I built and now support a system for someone, which is giving a ~£40/month (and growable) recurring income. The pub conversion has kept things interesting too. And finally, I'm starting to walk/bike/run more regularly. I had a regular work bonus this month, which will go straight into the pub refurb. One of the best thing I've done this year so far is focus on what I can control - No more reading the news, facebook, gossipping, engaging in pointless arguments - It's quite refreshing (and humorous when people tell me about some royal wedding etc. and I look back blissfully ignorant). - I started helping a local business out with some of their IT work last year. They have connected me up to a few other people (will be useful if/when I need help with other things), and we are looking to try a mini-business venture together. This started with me sending them a message "I see you've opened this new business, it looks great! Let me know if I can help out in any way with your IT" - Maybe a month later, we started talking. Now, I have a fairly regular supply of the consumables they make. - Mid last year, I sent a message out to someone in the city, regarding property help. This person is now my business partner with this new pub conversion, and a marketing expert that can help me with other ventures. - Two months ago, I sent a message out to someone offering my IT services for a particular niche-area they are working in. I offered to save them 50% on what they would have to pay. This is the new recurring income I mentioned in my latest update, and it looks like it might be growable quite easily/quickly. It's taken me a long time to realise this - But people are at the centre of success - And that is what I take to mean "interdependence". What do you think? I think that these are great real-life examples. I have to admit, that I know the theory of interdependence, but I don't follow it enough in the real world. The most interdependence I apply in the real world is at my work as a project manager and consulting. There I do cooperate with many people and work with them together. Although I like to work on my own for some time, I also really like teamwork. When I gotta manage a project there is no way around teamwork. So I do my best to coordinate efforts, create connections and putting everything first in order for team success. That is not always easy as you probably know. Managing myself is challenging sometimes (regarding motivation, ...) but manageing a team is even more difficult. Stephen Covey wrote about that interdependence is "1000" times more difficult than independence. He also said, that it is totally worth it. I follow that completely. So I will try my best to have (small) interdependence in my life. My net worth went down this month, for the first time since I can remember! This was due to piling extra cash into the current property refurb project. I expect the same for the next few months, after which we will remortgage and should see a large bump in net worth around Oct-Nov time. The new "~£40pm" recurring income has settled to £35pm income, and I'm in talks with someone else for an additional £10pm. In a previous mindset I would have passed on a lot of these opportunities, but with the new post-work mindset it's going to be a valuable trickle/stream of income for those expenses we can't eliminate. My wife organised a boating trip for my birthday this month, it was really fun. Whilst on the boat, we discussed their business tech (website etc.) and I suggested that I could help them there in return for some boating lessons. This feels even more right than taking money. What is the point of money if you can access the things you want/need directly through friends/family/contacts? My post-work life is finally starting to hatch, and reservations about leaving work are swiftly being replaced with a sense of urgency and excitement. Work is definitely getting in the way now, and I'm looking forward to changing things up. I have started to look into my expenses in more detail, to match them up better with the monthly budget. I pay "myself" a monthly amount to cover expenses. This amount has been fixed for more than a year, so I'm confident that it's accurate in the meantime. INPROGRESS 50%. Pub conversion property completed, and renovation is in progress (reopen downstairs as a pub/bar, create 8 residential units upstairs). Keeping eye out for 2nd, though it's unlikely this year now due to the scale of the first one! I'm considering getting a manager in to run this, rather than leasing out the property - Option for baristaFI/barFI! DONE 100%. Lendy all withdrawn, aside from defaults. CollateralUK went into administration, so my funds there are locked up, but eventually will hopefully come back to me. MT and ablrate have been drawn down. INPROGRESS 50%. Waiting for ensuite to be replaced. Quotes in for repainting outside and inside of the house (we've waited 5yrs, and I want to prevent maintenance/rot issues before I leave work). We're considering getting the kitchen replaced, and need to replace the radiators (15yrs old and the valves are all rusting). Other than that I think we're probably set for the long-term. INPROGRESS 40%. August has slipped to November. Last quarter it was only a possible "slip", now it's definite. I realised my expenses tracking is really poor, and that's probably the last thing I need to do to give me the confidence I need to leave. The small side businesses are proving themselves, and I'm looking forward to concentrating on those when I finish work. Investment and property income generates approx 70% of core monthly living income, and will be >100% once the pub conversion completes. Fun money will come from side businesses, freelance work and barFI. OMY Syndrome is going quickly, now that I'm building confidence with proving out the property, side business and expense tracking. An INTJ through and through! DONE 100%: I went boating, and enjoyed it - Likely to end up more regular in return for some of my tech help. BaristaFI/BarFI is likely to happen, so I can keep in touch with the pub business, and generally socialise too. I will focus a bit more on my tech side businesses. I look forward also to feeling energised enough to start running and cycling again. Another month of net worth dropping due to another pile of cash going into the refurb project. By end of Aug we will be practically able to rent out some rooms. Sept/Oct to re-open the bar, and remortgage Oct/Nov to normalise/bump the net worth back up. I have struggled a bit with keeping full track of my personal expenses, but it's an evolving/improving process. It's partly because I know that I've lived on £300pm "non-core expenses" for the last few years, so it's made me a bit more blasé. We found out that my wife is pregnant (woo! yay! Not a surprise, but a little overdue). From a FIRE perspective, I now plan to take paternity in Jan, and then the UK "Shared Parental Leave" for the remainder of 2019. It gives me the full year to real-try out "retirement", see how I survive and what I get up to (with a possible fall back / Plan B), but first and foremost spend time with family. The slightly downside is I'm pushing back my "FIRE" date from Aug->Nov->Jan, firmly into OMY . This month I've had some strangely different thoughts kicking in. I spoke to a wealthy/FIREd friend who, after 3yrs, is bored and thinking about doing a bit of part time work for socialising. His words "it's really great spending time with family and friends, but there's only so many coffees that you can drink in a week". As much as I'm trying to disagree with him, I have a niggling feeling at the back of my mind now that "I'm going to get bored", and "What if I want to go back to work!". I'll still therefore be taking my paternity and SPL for 2019, but I'm not going to force myself into a box of "I'm definitely then going to leave". It is still the intent/target for sure, but I guess as Jeff Bezos says, "strong opinions, weakly held". Later on in the month we went on holiday to France (swapped some work help for a free week stay). Stronger thoughts came in that "I'm not ready to give up the good life yet" and "6 months more work might mean one cheap holiday per year forever". Any advice out there from fellow FIRErs is most welcome! No advice. I worry about this too, and I think it's a legitimate concern for someone who has a little E mixed in with the INT*. On the flip-side, I worry that my worry is just evidence of my increasing institutionalization the longer I work. I feel like my adventurousness and creativity are being slowly sapped from me as I embrace the ease with which a structured job provides certain benefits (mental and/or physical and/or emotional stimulation/challenge, social interaction/connection, feeling of being part of something bigger than yourself (teamwork?)) which are necessary to humans or to a human's humanity (i.e., from the perspective that those things were the context within which humans evolved so perhaps that context is where we feel most "human" or perhaps even "happy"). I think others grapple with this as well, as I've picked up this theme from several other journals and blogs as well. The other possibility is it's just hedonic adaptation, so once a person has FIRE:d long enough, they're ready for the next new thing. I've stuck out work a couple years after hitting my FIRE number, milking a good situation. I think the option to work as I see fit has been as rewarding as stopping at the first viable number. It's fun to splurge some of the extra money at first. I've gotten bored of that though. Lucky thing is, the fire money makes it my choice. Thanks for the advice both! It appears that keeping the options open isn't a bad idea, as that should help me test the new situation and give a fallback plan if I need/choose to go back to work!